Later that year, a man named Marmaduke Wetherell, a well-known big game hunter, was hired by the Daily Mail to find evidence of the Loch Ness Monster. He later found large tracks on the edge of the lake and made molds, but the Natural History Museum examined them and said they were likely from a dried hippo’s foot which had become popularly used as umbrella stands. Wetherell was fired for failing to find any substantial evidence. On April 21, 1934, the most famous picture of the monster was published in the Daily Mail. The picture was supposedly taken by a doctor named Robert Kenneth Wilson, but he didn’t like having his name associated with the photo so it became known as the “Surgeon’s Photograph.” The picture shows, from a distance, the long neck and head of the monster rising from rippling water. The picture is convincing to the untrained eye, though critics, certain the photo was a hoax, claimed it was everything from an elephant to a diving bird. It turns out, the photo was a hoax. (shocker) In 1994, Christopher Spurling, the stepson of Marmaduke Wetherell, admitted to being involved in creating a model of Nessie’s neck and head and placing it on a toy submarine. The pair then took the model to Loch Ness and took photos of it in the water. Wilson was then given the photos because he was a trusted man, being a doctor. Wetherell was said to have come up with the hoax because he was humiliated by his previous attempt at finding the monster. Since then, countless videos, photos, and eyewitness accounts have emerged claiming to prove the existence of the Loch Ness Monster. In 1954, the first contact via sonar was made on Rival III, a fishing boat. 480 feet below the boat, a large “object” was seen keeping pace with the boat’s speed. In 2011, sonar contact was made again by Marcus Atkinson who saw an object about five feet long and 75 feet below the surface. It kept pace with his boat for two minutes before it disappeared. The sonar image has been examined and critics have dismissed it as an algae bloom. However, believers have said that algae couldn’t survive at 75 feet as it needs sunlight to thrive, and as murky as the waters of Loch Ness are, very little sunlight would reach so far below the surface. Many other searches have taken place to find the monster than those already listed. In 1934, twenty men sat at various locations around the loch with binoculars and cameras in the Sir Edward Mountain Expedition. They remained there from 9 to 6 every day for five weeks. 21 pictures were taken and examined, but they were thought to be of seals, not a monster. The most recent photograph was taken by George Edwards in November 2011. Edwards claims that it is the most convincing photograph yet, which perhaps shouldn’t be too much of a surprise given advances in easy to use and readily accessible home photo editing software. 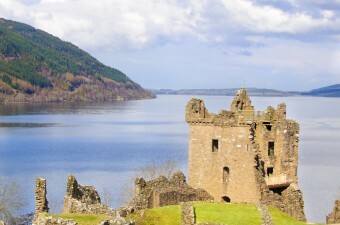 However, in this case, even other Loch Ness Monster researchers have questioned the authenticity of the picture, claiming the hump rising from the water in the picture is actually a fiberglass model that was used in the filming of a documentary by National Geographic, which Edwards had participated in. Loch Ness doesn’t freeze. Because of its depth, most of the water stays at a steady temperature of about 44 degrees Fahrenheit. Only the top 100 feet or so varies in temperature, but with so much warmer water beneath keeping things relatively toasty, you’ll not get a chance to ice skate on the loch. Loch Ness holds more water than all of the other lakes in Great Britain combined. A scientific name was given to Nessie in 1975—Nessiteras rhombopteryx, or “the Ness monster with the diamond shaped fin.” It is also an anagram for “Monster hoax by Sir Peter S.” Peter Scott was the man who gave the name to the monster. You need a fairly decent breeding population for them to have lasted this long? Which is to say more than one? One dude can’t hump himself for 65 million years. That’s straight up crazy. Wouldn’t dead ones wash up all the time? Wouldn’t they have eaten the loch free of fish generations ago? Wouldn’t this not fall apart under even the weakest of scrutiny? To put it in very basic terms, there’s no monster in the lake, there has just been a chain of liars. Not people making mistakes, not crazy people, just liars. Everyone who has ever claimed to see the Loch Ness Monster is a liar. what “Nessie actually does freeze. Not freeze down at the bottom but what if he/she comes up close to the surface to freeze. No… he would die unless hes inmortal. but that highly unlikely. but it could be a chain o f liars, or this actually true he just not described as the way people described him/her. “Nessie” could be a large fish. there could be a large water tunnel what he/she travels through along with the fishes theres “Nessie’s” food source. I think liars is a bit harsh but it could very well be true. U have a good idea why Nessis isn’t rea. I think it is a myth or folktale or legend. It is a pretty cool legend if you think about it though. How thousands and thousands of people say they saw it even though it is a myth. Theres so much lurking in the unknown, that calling it real would be stupid, but straight up calling it fake is also not very wise. There was a fish hat had been said to be extinct a coup thousand years ago, yet it was recently found again. you never know what is deep down in the depths of those waters. Animal Planet – Jeremy Wade – “River Monsters”. This show suggests that “Nessie” is actually Greenland sharks which travel into the loch periodically.